We're nearing the very end of our adventures in The Chronicles of Narnia . One last book and we've completed the series. It's been a fun week and I've been glad to revisit Narnia. No doubt I'll be back again someday - probably sooner rather than later. I just finished reading The Magician's Nephew which tells us the story of how Narnia was created. Again, I will write assuming you know the story already. If you need a refresher, see the Synopsis of Narnia that I posted earlier in the week. In this book Lewis makes some strong arguments for good magic and against bad magic. This book would probably give the Christian who likes to stay away from anything that appears to be too steeped in magic the most pause. In this book we are given example of an evil magician in Uncle Andrew. He would want to use magic for the purpose of self-advancement. He longs for glory and power when in actuality he really is a simple and stupid man. He knows just enough magic to get into trouble but not enough to understand truth. When he meets Aslan all he hears are growls and rumblings. Aslan can offer Uncle Andrew nothing but sleep as a means to escape from his frightful reality which exists because he has chosen to close his mind off to Aslan and live with false thoughts and self creations. Uncle Andrew is probably the character in all of the Narnia books that I pity the most because he understood a.) magic exists and b.) there is value in it. Yet he is blind to its best uses. 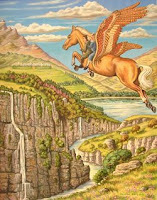 "The Chronicles of Narnia are themselves a kind of magic, a seven-volume magician's book devised by Lewis to break bad enchantments of technology and vanity and curiosity and bring about re-enchantments by means of honor, courage, and obedience by reawakening a longing for Aslan and Aslan's country." "Do you think I am trying to weave a spell? Perhaps I am; but remember your fairy tales. Spells are used for breaking enchantments as well as for inducing them. And you and I have need of the strongest spell that can be found to wake us from the evil enchantment of worldliness which has been laid upon us for nearly a hundred years." I've talked about my mistrust of generic magic in books before. I hesitate of Harry Potter because I don't understand the true intent behind the books. I rather didn't know what to make of it in The Enchanted Castle by E. Nesbit. . I love and accept it in Narnia. Is that wrong of me or does it seem as if I am accepting only what I want? Am I lacking in consistency? Something inside of me agrees that some magic is good. A lot of magic is bad. If used to display the power of the Gospel then I've no objection to it. If it truly represents the battle of good and evil and if good is the express victor then I am in support of it's use. As Lewis said, we need a little magic to break the spell of indifference towards truth in our own life. Above all - truth. That is the crux of the argument over whether or not it is good to use magic to tell stories. Is truth clear and does it win? Apart from the arguments over magic, I'd say this book was lots of fun and probably my second favorite in the series. I probably focused more on the character of Uncle Andrew than any other. He is distressing to me as I think about how many truths in my life I may be choosing not to see - and for selfish reasons! I hope I'm not much like him but the character does make me think and for that I welcome his existence. Next up - The Last Battle ! See my review of The Lion, the Witch and the Wardrobe. See my review of Prince Caspian. See my review of Voyage of the Dawn Treader. See my review of The Silver Chair / The Horse and His Boy. If in The Magician's Nephew, the kids had been magicians, I probably would have had a hard time with it. But instead it's Aslan, the uncle, Jadis doing the magic. Same thing for Lord of the rings - we identify with Frodo, we walk away identifying with him, wanting to be like him. I don't think people typically walk away living vicariously through Gandalf, as wonderful as he is. Hmm...very interesting thoughts on the issue of magic. I'm not sure where I stand except that I instinctively don't seem to have a problem with it in the Lewis books (as well as in Tolkien's writings). I don't quite know what that means. But I do think that magic in the hands of Lewis or Tolkien means something entirely different than it does in the hands of a non-Christian writer.